I didn’t necessarily intend to do book reviews on this blog, but I was midway through writing this on my Tumblr and realised it perhaps has a better home here. I’ve just finished Out of Oz, you see, the fourth and final volume in The Wicked Years by Gregory Maguire. It completed the sequence well, I think, and I just wanted to make a quick summary of my thoughts while they were fresh. The first book, Wicked, really affected me. I only read it as preparation, because I wanted to see a musical and Wicked was the only one I could get the family to see, so I read the novel first because I used to be very strict about that sort of thing. I do like the musical, don’t get me wrong, but the book’s so much better. It’s much darker, stranger, and more interesting. It takes a fairy tale world and grounds it. It explores the politics of Oz, asks questions about perspective and motive, but most importantly it is a sympathetic portrait of the Wicked Witch of the West, whose motive is revealed not as evil, nor as simply misunderstood as the musical would have it, but a misguided sense of the right thing to do, skewed by her place and circumstances. It takes a woman from innocence to the best of herself, before her decline into a broken woman. It manages to be a metafictional and cynical analysis of The Wonderful Wizard of Oz while being a work of art in its own right, with heart and insight into human nature. It didn’t necessarily need to be a series – whilst the first novel did leave strands that were worth following, and the second and last books were definitely enjoyable reads, the third book simply felt like an over-extended prologue to the final book while also being a not very effective character study, filling in backstory that had simply not been invented until it was needed to support the sequels. Baum only wrote sequels to his Oz stories to placate his readership, and similar motives may well be detected here. None of the successive novels recapture the focus of the first – while each is ostensibly centred around a generation of the Thropp family (save the third, which tells of the Cowardly Lion), none of the successive characters are as strong and as vividly drawn as Elphaba. It compensates by sharing the narrative voice around, but to a frustratingly limited extent, since Maguire seems to think he must slip back into the technique of the first book. This leads to his leaving of interesting dramatic scenes off to the sidelines, only to be revealed in almost monologue from characters were there. There is an entire major siege in the last book that is only related in hearsay. While this does contribute to the general theme of the uncertainty of history, political spin happening from the instant after the event, unreliable witnesses, and so on, and provides one genuinely good shock in the final book, it doesn’t make best use of the rich array of characters and situations Maguire has spun from Baum’s text. However, the way the final book ended I felt justified the enterprise. (I had similar feeling concerning The Dark Knight Rises.) It refocused the cycle on its core theme of tolerance, and ended with an evocative image. It manages to tie up strands without sucking the mystery – or, should I say, magic – of the series in the doing of it. The prose style is clear, perceptive, and occasionally gently humorous, and is a lesson in reworking someone else’s material as your own. What have I learned about the books for my writing? I can’t say it’s a trick I am able to copy just yet, but I appreciate the way Maguire can communicate his subtext clearly and baldly, but artfully, without sacrificing subtlety. He writes emotion very well, and strikes a balance between otherworldliness and the tactile that is very effective. 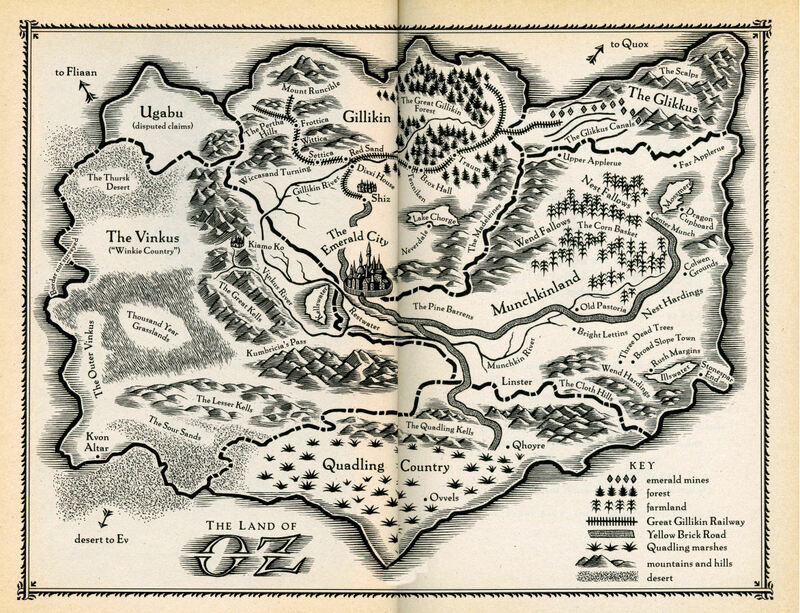 Were I to create a fantasy novel, I would aim to create a society as rich and believable as Oz is made, and note that it is best revealed through the interactions of the lead character – of course, this last point is in evidence even before Dorothy’s original appearance in print.